While many find it to be annoying, useless and sometimes scary, the service engine or check engine light is a actually a very useful tool for drivers. This light is triggered by sensors that detect some sort of issue in the vehicle's operating system. The problems vary, and there are many, many reasons that this light may turn on. While some of these issues are much worse than others, the most common things that make it come on are relatively simple fixes. But it is important that you bring your car to a mechanic as soon as that light turns on in order to have the issue properly diagnosed and repaired. Not doing so can lead to bigger problems, as demonstrated by this first issue, which is followed by three other common check engine light triggers. The catalytic converter is designed to convert hazardous engine exhaust fumes into less harmful emissions. This part uses rare metals and is expensive to replace, but it won't fail unless another, smaller problem came before it. The initial problem would have illuminated the check engine light but having failed to get the issue diagnosed, it grew worse, resulting in a need for an unnecessary and expensive repair. The MAF (Mass Air Flow) sensor detects the air that flows into the air intake and calculates how much needs to be mixed with the gasoline in order to create a proper running engine. If the MAF flows these calculations will be off which results in the engine running rich, meaning it is using too much gasoline. This issue not only decreases fuel efficiency but it can cause numerous other problems for your vehicle's engine as well. An exhaust leak will throw off the readings being taken by the Oxygen Sensor, which can also cause your vehicle to run rich and create a drastic increase in hazardous emissions fumes. If the sensor is unable to obtain proper readings of the amount of oxygen in the exhaust the check engine light will be illuminated. The best news that you get get in regard to a check engine light is that it was caused by a loose gas cap. A loose, cracked or otherwise damaged cap can allow gasoline vapors to evaporate out of the filler hose, triggering the light! Always be sure your gas cap is tight every time you fill up! When the light comes on head to the repair shop right away to avoid the chances of the problem growing worse. If you need check engine light repair in Palo Alto, Mountain View or the surrounding areas be sure to contact The Car Doctor. Our team of skilled auto repair technicians will restore the reliability of your vehicle in no time. 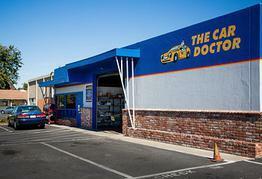 Give us a call at (650) 492-6853 to request professional auto repair in Palo Alto today.